I have been a user of Kaltman Creations’ products since 2010 and was looking to buy a RF spectrum analyzer that would have more functionalities than just scanning, and would also be cost effective. After a bit of research, I found the Invisible Waves X RF Command Center. I had been working with basic scanners and was a bit disappointed by their lack of flexibility, and the fact that, aside from going from left to right on the screen, they couldn’t offer real time level monitoring of my carriers and many other things I needed. The equipment rack that is part of the audio suite. 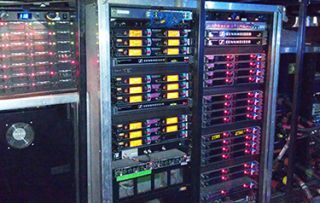 When I started the Michael Bublé Crazy Love tour, our RF count was pretty low, but shortly after starting rehearsal, and the firsts tour legs in the US, production desired to upgrade the monitoring system from a 4 Stereo IEM / 12 Mics system to a 14 Stereo IEM/12 Mics system. That is where the Invisible Waves X RF spectrum analyzer capabilities came in handy. The real time monitoring of multiple frequencies with dropout alerts and a comprehensive interface simply suited my needs. It gave me the ability to have a fixed RF interface setup that I could update everyday, without having to retype all of my marker names. I could just punch in the frequencies I needed to monitor and there it was. I was later contracted to take care of the RF / Comms for the Cirque du Soleil: Michael Jackson: The Immortal World Tour. This challenge was different, as we have around 65 Channels comprised of 18 Stereo IEM, 25 mics, 12 BTR82n Packs, and 4 TX frequencies for these BTR80n, plus spares frequencies. Being that I stepped in after the beginning of the tour, I was on an already built set. I thought I could bring my tricks of the trade to improve on what I could. The setup called for very solid radio links, especially for the comms, in that all calls for acrobatic flights, show calling and set piece movements require the coordination of more than 20 people on deck. If an emergency was to occur, this is the vital link. The shark fins antennas provided good sounding links, but with quite a bit of hissing, and some multi‐paths drop outs, depending on the venue. When I saw that Mark Kaltman and his team had come up with a new CPAntenna (using circular polarization) I contacted them and got a few for us on the road. I decided to use one of them as the RX antenna of my BTR system. The result was very impressive. Although, at first, the scanner reading was showing a bit lower strength on the carriers, the consistency of the reception coverage, and the absence of residual noise were stunning. The coverage distance went from backstage almost 100 feet to the end of our B stage. I decided to try them on the RX for our mics and the result was consistently as good. As I mentioned, many of the production numbers take place on the B stage, and, as before, the coverage was very consistent.